titled Confronting the Cults by Gordon R. Lewis. There are many "secular" definitions of what classifies a cult, unfortunately many are so broad that they would include (by definition) loyalists to political figures, fans of the Braves, followers of any philosophical thought, and Christians. Lewis defines the term "cult" as "a religious group which claims authorization by Christ and the Bible but neglects or distorts the gospel, the central message of the Savior and the Scripture." + Adds to the 66 books of the Bible by words or personal interpretations. - Subtracts from the deity or the Persons of the godhead. x Multiplies works to the already-finished works of the Lord Jesus for salvation. / (couldn't find a division symbol) Divides the loyalty of their followers between God and their organization. 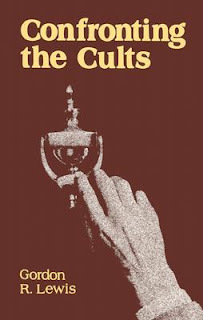 The cults specifically addressed in the book are theological cults (as opposed to mind-control cults): Jehovah's Witnesses, Mormonism (Latter-day Saints), Christian Science, Seventh-day Adventists, Students of Unity, and Spiritualists. Each of these have committed one or more of the above heresies and yet claim to be "Christian" (which is why Jehovah's Witnesses, for example, are not classified as a world religion but a cult of Christianity). The New Testament warns against false prophets and teachers rising up from within the church (Acts 20:28-30; Matthew 7:15-16; 2 Peter 2:1) who will "secretly bring in destructive heresies." Maintaining the appearance of godliness, these groups are successful in leading many people astray. How many times has a Jehovah's Witness or a Mormon knocked on your door? What are we called to do in that situation? I used to open the door and engage them in discussion. But, quite frankly, now I just ignore them. But what does the Bible tells us to do? For one thing, we should keep in mind 2 John 1:10, "If anyone comes to you and does not bring this teaching, do not receive him into your house or give him a greeting." This does not mean "ignore them"; it simply means, "don't invite them in." On the other hand, we should also bear in mind that the primary call of Jesus on every Chrisitian follower is to be a witness and to make disciples. As much as I want to ignore the inevitable argument that stands knocking at my door (on my day off, usually), my responsibility is to "be ready" to share the love of Christ with "whoever demands a reason for the hope that is within [me]." Let's face it, they've come to tell me what to beleive, not to hear what I have to say. But still, I never know how the Holy Spirit may have prepared that person to hear the Gospel message before they were led to my doorstep. It's not my mission to judge who will hear and be saved, just to be a witness. I recommend the book and other materials by the Nicene Counsel, if you're looking for good information on the cults. They also have some very worthwhile documentary DVD's on the topic.